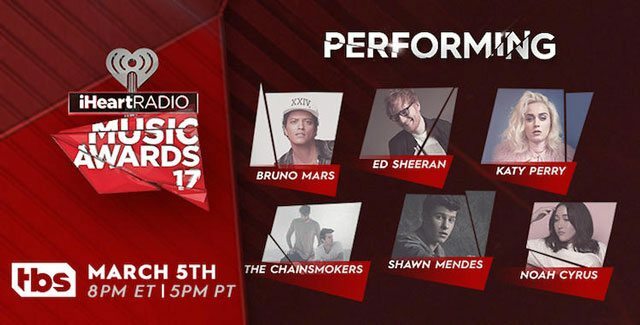 The new batch of performers just announced for the 2017 iHeartRadio Music Awards includes Katy Perry, Ed Sheeran, and The Chainsmokers. Shawn Mendes, Thomas Rhett, Noah Cyrus and Big Sean are also confirmed to take the stage during the awards show scheduled to air live on TBS, TNT and truTV on Sunday, March 5th at 5pm PT/8pm ET. Ryan Seacrest is set to host the show which is taking place at the Forum in Los Angeles. Drake leads this year’s nominees with 12 nominations followed by The Chainsmokers with 11. Music fans can vote for the winners through February 24th at iHeartRadio.com/awards.